Australia has more than three times as many sheep as people, and the second largest flock on Planet Earth. So, yeah, you grow up eating a lot of those woolly buggers over there. That gamey craving haunts your dreams (Peter). 1. Trim lamb of excess fat and sinew (some will burn off on the barbeque). Cut across the grain into chunks 1.5" square. 2. Soak your skewers in hot water (they'll last longer before burning if soaked through). 3. Whisk all marinade ingredients together and add to meat - cover all the morsels. Let set for 2/3 hours - or best overnight (acceptable to wait just 15 mins in a pinch). Combine all ingredients then test for flavor. Adjust as needed. 5. Cook the skewers, ensuring the middle is still pink. 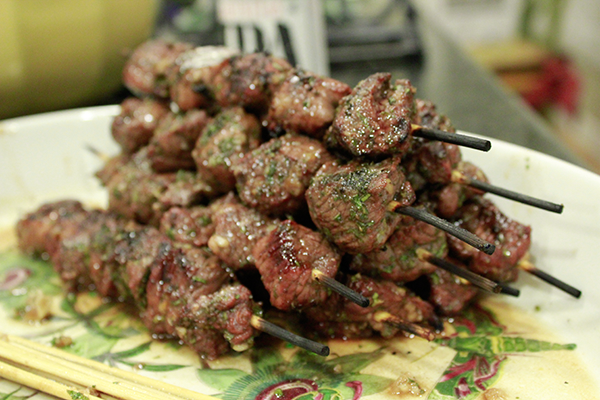 Brush (or re-dunk) with the marinade once or twice while cooking. 6. Spoon sauce over lamb in main serving dish, or allow diners do it them bloody selves. 7. Serve with chipotle rice and salad, and wash down with a coldie fresh from the Esky.